There are a few flaws here, but Dragon 13 delivers fast and accurate speech recognition. Reviewers of speech recognition software often publish the unedited transcripts of their dictation sessions, with predictably hilarious consequences. Unfortunately for us Dragon 13 doesn't want to play that game: in normal circumstances with a good quality microphone it performed flawlessly, converting long texts into type without significant errors. The days when voice recognition software made irritating errors such as hearing "new paragraph" as "uterus" – hello, IBM ViaVoice! – are clearly long gone. Dragon NaturallySpeaking Premium comes in three versions: the standard version at £139.99, and the Wireless version, which bundles a Bluetooth headset at £199.99. There's also a Mobile version, which includes a Philips Digital Voice Recorder you can use to dictate when you're out and about before transferring the recordings to Dragon for processing. That's £199.99, too. Dragon is designed to do two things: to turn your speech into text in your various applications, and to enable you to control your computer using only your voice. 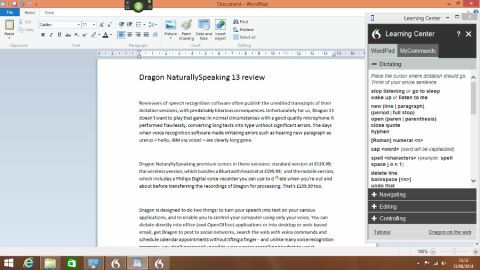 You can dictate directly into Office (and OpenOffice) applications or into desktop or web-based email, get Dragon to post to social networks, search the web with voice commands and schedule calendar appointments without lifting a finger – and unlike many voice recognition programs, you don't necessarily need to wear a noise-cancelling headset to use it. Dragon supports a PC's built-in microphone and its own Dragon Remote Microphone smartphone app (not to be confused with the Dragon NaturallySpeaking app, which is a standalone product for on-the-go dictation), which connects via Bonjour to enable the use of a smartphone as a microphone. You can also use your phone's native recording app to record notes and ideas when you're out and about and then put them into Dragon when you get back to the office. However, if you work in a noisy environment a headset with a noise-cancelling mic is still the most effective option. We encountered major problems installing Dragon on our previously problem-free 64-bit Windows 8.1 PC – it failed to install a required MSXML component, an issue that led to many frustrating and unsuccessful hours trying to identify and repair the problem. In the end we gave up, wiping our PC, installing a clean build of Windows 8.0 and then upgrading to 8.1. That solved our installation problems, but it seems we're not the only ones to encounter issues with Dragon's installer. Once we installed the program, we were pleasantly surprised: Dragon dispenses with the long and tedious training sessions of old (although they're still there if you have the time and patience). There's just a short microphone check and then you can start dictating via the auto-hiding DragonBar that appears at the top of the screen. This enables you to turn the microphone on and off, and to access Dragon's various features and settings. On Windows 8, Dragon works in both desktop and Metro/Modern mode with a few exceptions, so for example the web component works in Internet Explorer in Metro/Modern mode, but not in Chrome or Firefox.